Italian lettuces come in all sizes, shapes and textures. You can harvest them at any state – as mesclun when they are 3-4 inches high, as baby lettuce where you serve the entire head, or as traditional full-sized plants. Some lettuces do best in the relatively cool weather of spring and fall. Most butterheads like Quattro Stagioni and Regina di Maggio and Romaines prefer the cool weather. 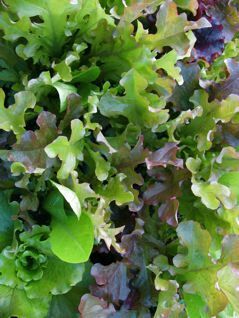 Crispheads like Rossa di Trento, looseleafs like Lollo Rossa and Biscia Rossa and cutting lettuces like Bionda do well in summer as well as spring and fall. If you are growing for mesclun or baby size, all will do well most of the year, except in places with very hot summers. Lettuces are very cold hardy and will survive a significant frost. Planting. Lettuce prefers a fairly fertile soil with a high nitrogen content and requires a regular supply of moisture. We recommend using 4-6 week transplants for several reasons. First, you often have a little space here and there where you can tuck six or eight lettuce transplants. Second, it makes weed control easier. Hoe before transplanting. Hoe again in a few weeks when more weeds have just emerged. After that, the lettuce is usually big enough to shade out most weed growth. Finally, lettuce germinates poorly when temperatures are above 80-85 degrees. In mid summer, use of transplants, perhaps started in a cooler basement, is almost required. If you direct seed, put three to four seeds every foot in rows 1 foot apart. Thin to one plant. You can seed as early as the soil can be worked. Make new plantings every two to three weeks for a continuous harvest. For transplants, you can put them out four weeks before the last frost date (six weeks if you give them some protection with row cover). Colors tend to be more intense in cooler weather. For example, spring planted Quattro Stagioni lettuce are usually a creamy green with red on the tips of leaves. Quattro Stagioni that matures in October is almost completely red. Mesclun mix, cutting lettuce. Plant in a well-prepared bed. Thinly scatter seeds over the surface, trying to get them ½-1 inch apart (just scatter them and don’t worry all that much about spacing). If you have some finely sifted compost, cover the bed with 1/4 inch of compost. If not, just drag an iron rake through the area you seeded and tamp everything well with your hands, hoe or whatever. Keep the bed moist until seedlings emerge. Depending on the weather, it will take anywhere from three to seven days. Harvest when 4-5 inches high by cutting about ½ inch above the soil line. Make plantings every two to three weeks for a continuous harvest. If you use 4-foot beds, a 2-foot section of bed will provide you with plenty of lettuce for several weeks. You can also dig out some of your seedlings and transplant them elsewhere to grow on to baby or full size heads. Diseases and pests. There are few insect pests that bother lettuce. Wire worm can be a problem in early spring, but can usually be defeated by placing a paper collar around transplants. Aphids can become a problem, but if you watch for them, you can usually wash them off with the hose before their populations build up to destructive levels. Harvest, storage and use. Harvest lettuce in the morning or evening if possible. Immediately rinse and put in a plastic bag in the refrigerator. Of course, you can make a traditional salad with full-size lettuce or cutting lettuce. Try some other things, however. A baby lettuce with a few slices of tomato, some fresh herbs, some good olives and a few slices of a good Italian ham is almost a meal.